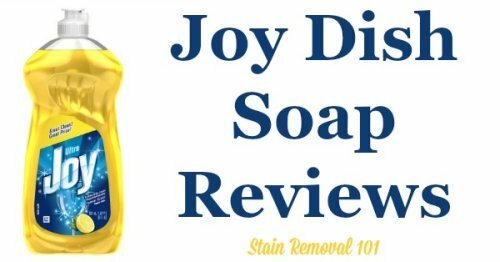 Below are several reviews of lemon Joy Dish Soap, including thoughts from readers who have liked it, or not, and why. 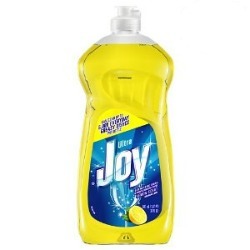 Joy is a classic dish soap brand that's been around for quite a while, and comes in only one scent, lemon. 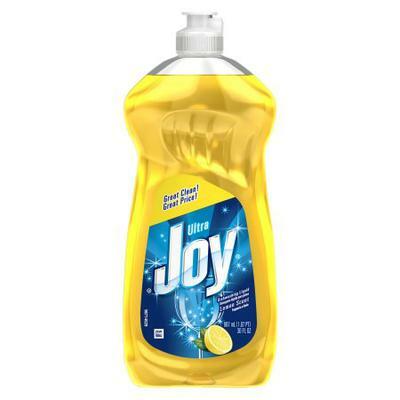 I've found Joy is starting to be a bit harder to find in stores than it used to be, but can still be found with the dish soaps in many big box stores, like Walmart. So here are the reviews! 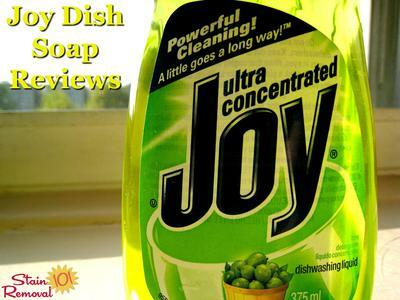 I have been using Joy dishwashing liquid for over 10 years now. I started using Joy because it was a good price, but I soon realized that it was also a great product. I am able to wash all of my glasses and dishes, and I still have plenty of soap suds left for my pots and pans. That is a great thing since I don't own a dishwasher, and have to wash everything by hand. Joy smells nice and lemony! It also makes my hands feel nice and soft. In addition to the normal uses for it, I've even used it to wash our outdoor furniture! I just put a little Joy in a bucket and add water. It does a great job. The best part is that my kids have even used Joy to blow bubbles. It has a nice smell and leaves no marks on anything. At only $1.19 you can't go wrong! A product that's great for me and even for the kids. My husband has even used Joy to wash his bicycle. It gets a lot of use for only $1.19! 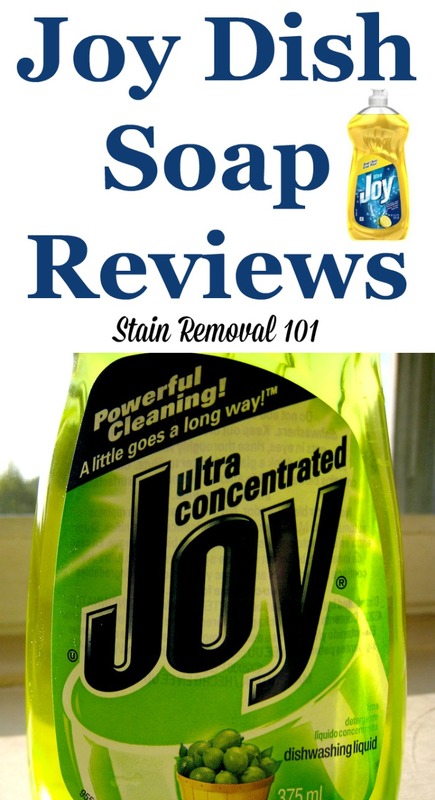 Thanks Lucille for sharing your review and uses for lemon Joy dish soap. Even more people have raved to me about this product, telling me why they love it. You can see an additional review below. I'm always looking for even more reviews though. You can share your dishwashing soap review here, for this or any other brand, telling me what you like (or don't) about it, and why. In addition, you can read lots of other reviews of other brands that have already been submitted. Scroll down for even more reviews of Joy, below! Char shared her experiences with Joy dish soap. I have used Joy for 45 to 50 years and have used it on everything from dishes to washing the car and everything in between. A couple of times I tried another product but went running back to Joy. This week I have noticed that I cannot get any suds out of Joy no matter how I try, like getting fresh water and trying again. Also, I am noticing a slight film on some things like plastic food containers. This has never happened before. I was just wondering if the EPA has invaded my favorite product and changed the ingredients? Nothing else in my home has changed. I have soft water and there should be lots of suds. Char, thanks for sharing your experience with me. Don't you just hate it when you've used a product happily for years and then it no longer works like it has before? That can be very frustrating. Typically, when a product goes through a reformulation it says so on the packaging, but I'm assuming you didn't see any mention of a reformulation there. I tried to check on the manufacturer's website too, just to see if I could find anything else that might give us a clue of what is happening. Unfortunately, it does not appear that Joy has a website. It is manufactured by Procter & Gamble. Because the product is manufactured by a leading company in the cleaning industry, P&G, I would suggest calling customer service with your complaint to see if they can help you, or give you a coupon for a new bottle since you may have gotten a dud for some reason. Sorry I couldn't be more help, but if you call them and they tell you anything interesting please let me know. I've answered this question as part of my site where I provide cleaning help. If you've got your own question I encourage you to check it out and see if I can help you too! Edna has also shared her Joy dish soap review, also in the lemon scent. I have been using this liquid dish soap, I suppose since it came on the market, I can't say exactly when, but I would imagine since the 1970s. It was probably one of the very first to use the scent of something besides the soap smell. I used Lemon Joy and the aroma was wonderful and it made so many suds you had to rinse them very carefully to get all of the soap off. The bottle was attractive and the bright yellow soap immediately made you thing of lemons. Another thing that made it attractive was that you only needed a little bit to do the dishes. So it saved money although at the time I think it was about twenty five cents. I still use Joy. I guess it's hard to change old habits, but I like, it does the job and the price is right. Not twenty-five cents, but close enough. I still wash all of the dishes by hand. I don't have a dish washer and I don't mind, not with this soap. Thanks Edna for sharing your remembrances of this dishwashing soap, and how you still use it today. One thing I've noticed about this detergent is that you can still buy it in the non-concentrated version, and also now in the Ultra version. Has anyone compared these two types to say which one they like better, and why? You can share your dishwashing soap review here, or read other reviews already submitted. I too have always used Joy. I have occasionally bought another brand, but always returned to my lemon Joy. For some time now the only store I can find it is in Walmart. I am afraid that is going to go away completely. I sure hope not! My Grandmother and I had been avid users of Dawn forever. I started using Palmolive at one point and just fell in love with it but I started having reactions to it because of allergies so I had to find something else. Even Dawn had my allergies acting up which was strange. Well my Aunt suggested to use either Sun or Joy. I bought a bottle of the Joy and started to use it. After lunch yesterday I washed out a pan I used so I would have it to prepare dinner later. It worked great. However, after dinner when I started doing dishes everything was fine, or so it seemed. My Grandma walks by the kitchen and tells me it smells too strong. I continued to do the dishes and my eyes started to burn and she starts to sneeze. So, I will be going back to Palmolive (original since I had less of a reaction to that) until I come across something I can tolerate better. I love the product, I just can't use it. I can't use Joy. I appear to be allergic to it. My hands break out, burn and are bright red. This is the only dish detergent that has ever done this to me.